If ever I had a "Signature" photograph, this might be it. 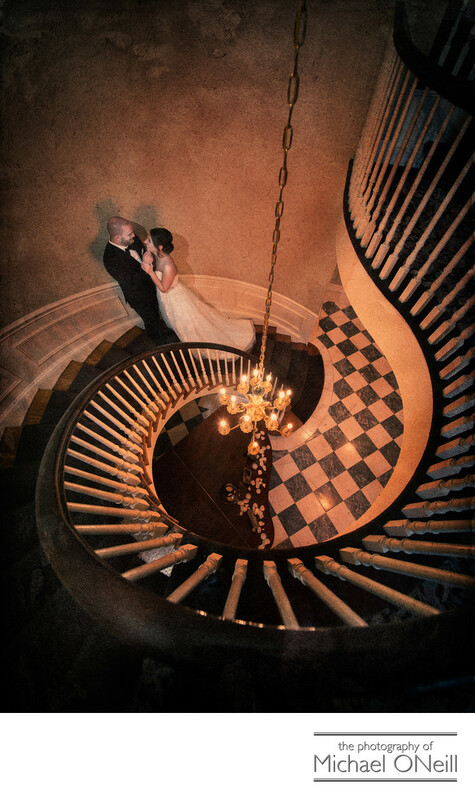 This beautiful circular staircase is located at The Royalton Mansion in Roslyn, New York. I have a great working relationship with this upscale catering establishment and photograph many weddings there throughout the year. This photograph is one of my most popular images and every single bride that hosts her wedding at The Royalton asks me to duplicate it for her. Any experienced wedding photographer can tell you that this is not an easy photograph to create. For starters it requires the use of an extremely expensive super wide angle lens that few wedding photographers can justify owning. Then, after taking the picture, an extensive knowledge of digital enhancement techniques in Photoshop are used to create the vintage, textured and artistic feel of this finished photograph. Another variation of this picture is actually used as a full page advertisement by the caterer at The Royalton Mansion. If you are planning a wedding at The Royalton, or any of the other legendary Nassau County Gold Coast mansions (Oheka Castle, Glen Cove Mansion, deSeversky Mansion, etc) give me a call. I have many years of experience working at all of these fine establishments and would love to work with you on making your wedding memories everything you hope they will be.